Hey, whatcha doin’ with that college degree? Maybe you’ve been to Israel and want go back – maybe spend a year in a work study program. You’ve got what it takes – your curiosity and people skills, your spirit of adventure, your sense of purpose and just enough Hebrew to spread your wings and fly. . .
Two words for you: Masa Israel. Masa (the Hebrew word for journey) Israel Teaching Fellows (MITF) is a program that brings young adults from North America and other English speaking countries to communities in Israel’s economic and geographic periphery for the purpose of teaching English to underprivileged school children over the course of the academic year. Now in its sixth year working in partnership with Israel’s Ministry of Education, MITF has placed hundreds of fellows in Israeli schools with large populations of immigrants from Russia, Ethiopia and other countries. Currently, 80 Masa Fellows are spread across the country, including Netayna and Nazareth and Migdal Ha’Emek in Jewish Detroit’s Partnership2Gether Region of the Central Galilee. Migdal Ha’Emek is newly added to the program this year with funding from the Jewish Federation of Metropolitan Detroit to support four Fellows, now living in Migdal Ha’Emek and teaching English in five of the community’s schools. 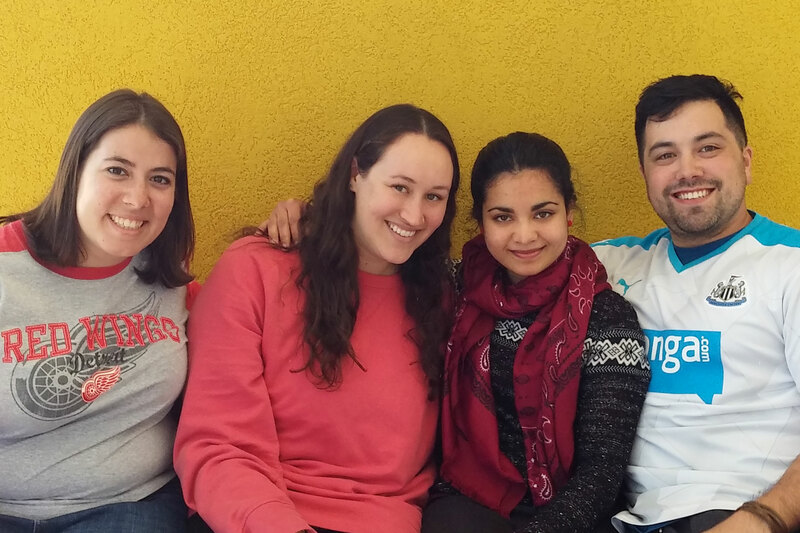 Featured in the photo above, from left to right, the 2016-2017 Masa Israel Fellows are two Jewish Detroiters – Tamara (Tami) Greenberg, 23, from Oak Park and Jaime Bean, 24, from Huntington Woods – with Suzanne Kaveri , 26, from Brisbane, Australia and Nathan Sheade, 28, from Palatine, Illinois. A graduate in Anthropology with a Masters in Social Work from the University of Michigan, Jaime previously has been on Federation’s staff as a NEXTGen Detroit Intern. Additionally, she is a member of the Tamarack Camps Young Adult Advisory Board. Tami holds a B.S. degree and teaching certificate in Elementary Education and Physical and Other Health Impairments Special Education from Eastern Michigan University. 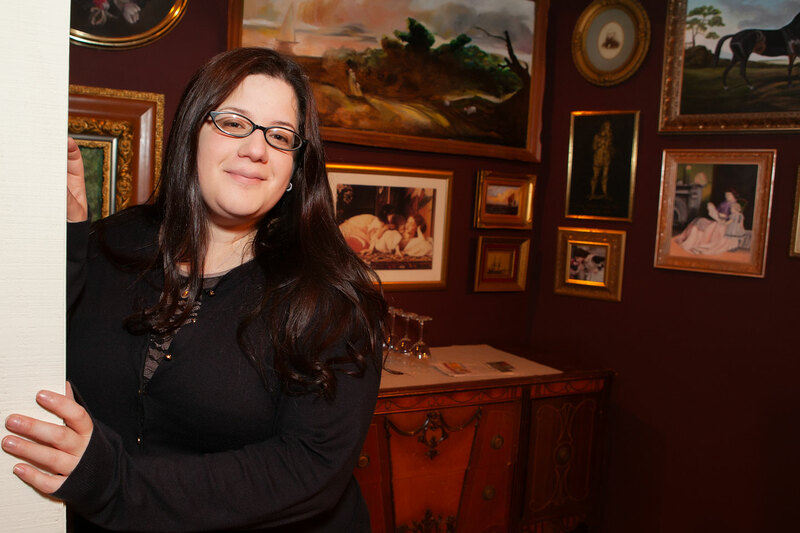 She also has taught Religious and Hebrew School at Temple Beth Emeth in Ann Arbor. “I apologize for my English in some of my answers,” writes Jaime in response to questions recently emailed to her. “I have found that my English is somehow declining as my Hebrew is getting better!” And there you have proof positive that the Masa Israel Teaching Fellows program works both ways. What was your prior experience in Israel? Tami: I have been fortunate to take part in both the Detroit Federation’s 2010 Teen Mission and the Detroit Community Taglit-Birthright in December 2014. Jaime: Before the Masa program, I only had been to Israel once on the Detroit Community Birthright trip in May of 2015. I always many Israeli friends, though, from my years at Tamarack. I knew that I was going to love it before I left for Birthright and, after the trip, I felt that there were still so many things to see and do, the only way I could really get immersed into the culture and explore Israel in depth was to live there. What drew you to MITF? Jaime: About a year ago, I made the decision to spend 10 months in Israel teaching English. 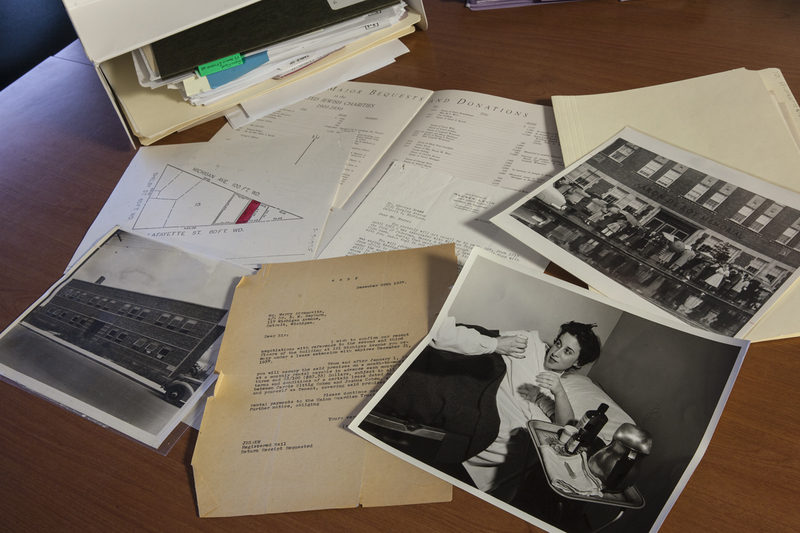 I was at the end of my graduate school program and was looking for a change of pace and experience in which I would both be challenged and would enjoy. I knew that I wanted to be in our Partnership Region, in the North, and not in Tel Aviv or Jerusalem. Most of the other internships are located in Central Israel, but I knew that living in the North would give me a much different cultural experience. You are much more immersed in the diversity of neighborhoods that make up Israeli culture here in the North and there is so much to see and do. I got connected to the program when I was interning at Federation and also just used the MITF website to get in contact with one of their recruiters. 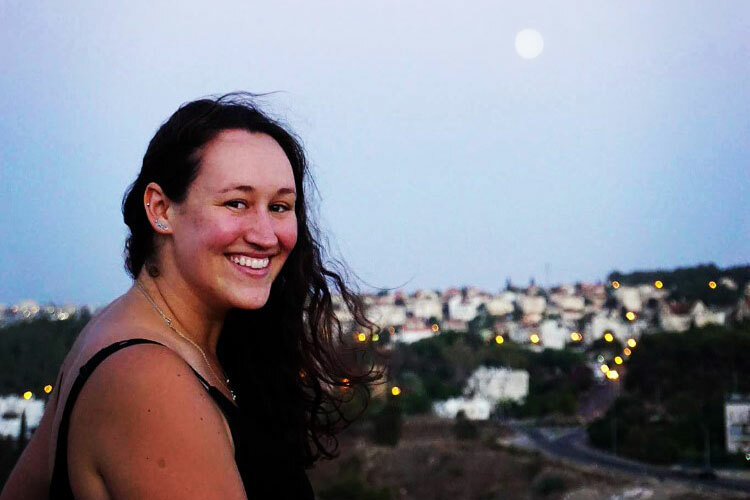 Tami: I first learned of Masa on a Taglit-Birthright trip in 2014 while I was still in school. The prospect of spending a year teaching in Israel sounded like the opportunity of a lifetime. And, when I researched the program and found that Masa was starting for the first time in Migdal Ha’Emek, Detroit’s Partnership area, where I had made friends on previous trips to Israel, I applied without hesitation. Which schools or program in Migdal Ha’Emek are you serving? Tami: I work at Aliza Begin Elementary School with grades 4 through 6 in small groups of two to six students at a time. Currently, I am also exploring an option of teaching younger students in the 1st or 2nd grade once a week. Beyond the school day, there are lots of opportunities for learning on our part. Two or three evenings a week we have programming, like Ulpan (Hebrew classes) or meetings with our education adviser. Our other evenings are free to do as we like. Weekends are Friday and Saturday here, so on some weekends I leave Thursday after school to travel to Tel Aviv or Jerusalem to see friends. Jaime: I work with 8th and 9th graders at Rogoz in Middle School one day a week and with 1st through 6th graders at Yigal Allon Elementary School three days a week. Generally, I work with small groups between two to seven students; however, with 1st to 3rd grader, I work with my host teacher because we mostly do exposure activities such as songs and coloring worksheets. I like the freedom to take the material and teach it to the students any way that I want. I use games and interactive activities because this is the best way for my students to learn. Everyone is different, of course, but I have found this works best for my students. 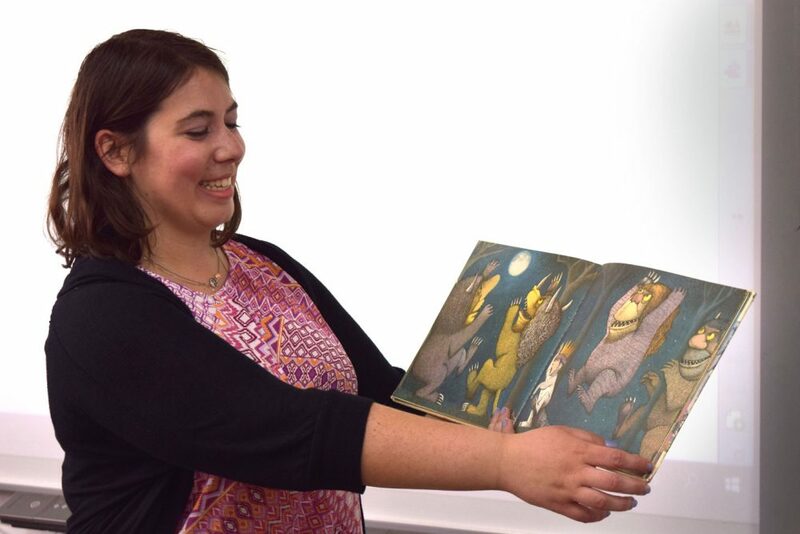 Tami Greenberg shares the joy of Wild Things, reading the Sendak classic in English with her young students. Tami: I came to Israel with very little Hebrew. I knew the Aleph Bet and a couple of small phrases. Since being in Israel for six months, my Hebrew has gotten a lot better. And, the students love to help teach me Hebrew, and love when I use the occasional Hebrew word in my lessons! Jaime: Israeli culture, especially in the school setting, is very different. It took a few weeks to really get the hang of how everything works in a school. The other obvious challenge is the language. At first it was very difficult to communicate with the students, but as I have been here, not only has my Hebrew improved, but my students also can understand a lot more of what I say to them in English. Your best advice to new Fellows coming into the MITF program? Jaime: Make the most of your experience in Israel. Never say no to any opportunity you are offered, whether it is participating in a Masa-wide event or being invited to a family’s house for Shabbat. There is so much to do and see and so much to learn, I feel the busier you are the better! And enjoy your students! Since I am not a formal teacher, I have a different kind of relationship with the kids. I also live in the same neighborhood as many of my students, so we will walk to or from school together. I really love these kids and know that even if they are not fluent by the time I leave, they will have some proficiency and confidence in the English language. Tami: My advice – have fun! Take the year as your time to grow, to travel, to learn more about yourself and, most importantly, to have fun every day. In school, I play games with the kids to encourage them to use English. On the weekends, I take advantage of all that Israel has to offer, whether it be sharing Shabbat with one of the many host families in our Partnership Region, or traveling. During school breaks, I take the opportunity to do longer trips, like taking a week long Europe trip over Passover! What more can you tell us about your time spent living in the Partnership Region? Jaime: We have been given a unique opportunity to live and volunteer in our Partnership Region. There are so many people here who consider us part of the family solely because we are from the Detroit area. Having never lived abroad, I felt so comfortable coming to a town where I already knew people and where I knew that I already had a community to be a part of. This is our opportunity to give back to a community that has had a relationship with our own Jewish community in a very special way. Tami: Living in Migdal Ha’Emek, which is part of the Detroit Partnership Region has been amazing. In addition to the Bina and Masa staff, we have the support of the Partnership staff and the Detroit Federation back home. Within the first week, the Partnership set up a meeting with Israelis who are our age and live in the area, so we had friends outside of our program. And, since then, they have set up host families for us that have invited us into their homes for all of the holidays so that we never feel alone. For more information on the Masa Israel Teaching Fellows program and other work/study opportunities supported by the Jewish Federation of Metropolitan Detroit, call or email Jacob Allen at 248-203-1467, allen@jfmd.org or visit Federation online.